Study Medical Photos: A 38-year-old man presents with rapid hair loss that has occurred over the last few weeks. A 38-year-old man presents with rapid hair loss that has occurred over the last few weeks. A 38-year-old man presents with rapid hair loss that has occurred over the last few weeks. He reports that his father had a similar condition. have no other symptoms. The most common area affected is the scalp; however, the condition may also affect the eyebrows or beard. Alopecia areata usually affects children and young adults and is recurrent. 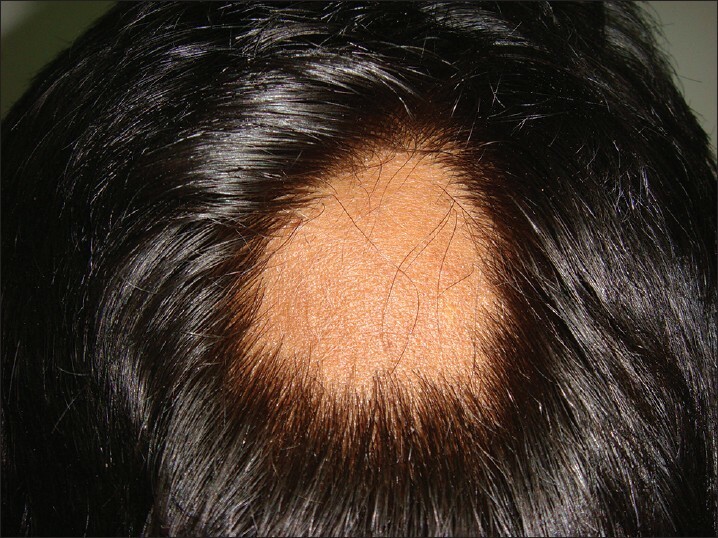 A pathognomonic sign for alopecia areata is the “exclamation point” hair, which is wide distally and narrower at the base. These hairs are often found at the periphery of a patch of hair loss. Hair that regrows in the area of alopecia areata is in many cases white. Nail pitting may also be present. The treatment consists of injection of intralesional steroids and topical steroids. Most experience complete regrowth of hair. The following related article may be useful.